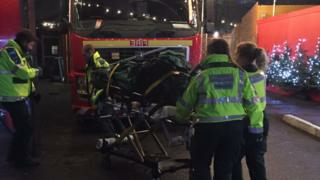 Some people in London had to wait up to seven hours for an ambulance on New Year's Eve after IT systems failed, an internal investigation has found. Some emergency calls were diverted to Scotland as London call handlers became overwhelmed, with one call not answered for nearly 25 minutes. Calls had to be recorded by pen and paper for nearly five hours on one of the busiest nights of the year. One person died, possibly as result of treatment being delayed. The clinical safety review carried out by the London Ambulance Service (LAS) found no other significant impact on patients. But it found the Computer Aided Dispatch (CAD) system failure was not an isolated incident. There had been two other recorded CAD failures in the preceding 12 months, which the review said raised questions about the quality of the overall resilience of the CAD system. The review also found the LAS board was "not sufficiently aware of the technical resilience risks" to the CAD system, adding scheduled testing and maintenance was not regularly performed. Seven risks to the CAD system were identified but nothing was done before the New Year IT failure, the review found. Moreover, no system maintenance occurred on the CAD system between June 2015 and February 2017, during which time there had been six software updates. The review also found little evidence that a full-scale simulation of an IT failure had been carried out for nearly two years. There were 2,810 emergency calls made between 00:30 and 06:00 GMT - the period the CAD system was down. But 446 calls had to be dealt with by other call centres outside of London, including as far away as Scotland. The review found the longest a caller to the LAS had to hold before speaking to a handler was 24 minutes and 34 seconds. The IT shutdown meant the real-time, web-based mapping of ambulance crews failed too, forcing staff to rely on radio communications only. In the case of the patient who died, the report found the patient was "conscious and breathing" at the initial point of contact. The report also found the call handler remained on the call while the patient's condition was assessed "in line with procedure". When the patient's condition deteriorated, an ambulance was dispatched and arrived on the scene 12 minutes later. But paramedics were unable to resuscitate the patient. LAS said the "family have been kept informed of the investigation, and the serious incident report will be submitted to the coroner for a pending inquest". LAS chief executive Garrett Emmerson said: "The system fault that occurred on New Year's Day has been fixed and cannot now happen again. "However, I would like to apologise to patients who had to wait longer than they otherwise would have for medical help on that morning, and pay tribute to our staff who responded incredibly well, ensuring patients continued to receive care during our busiest time of the year."